Saturdays around here can get pretty hectic sometimes. Today it's snow, rain and sleet outside so we're mostly staying home. I got dinner in the oven then had an hour to wait. Tom was in town running errands, so I indulged myself. I grabbed a cup of coffee (plenty of creamer and a sugar cube added), my knitting, and selected the genre "Opera" in Media Player. I suspect Tom may not be all that enamored with opera so it's a special treat I have for myself when he is absent. I think back to what first drew me to the sounds of opera and I recall some specific times when songs embedded themselves into my soul. First there was Carmen and Gilligan's Island. In one episode the characters put on a performance and as near as I can recall, The Professor had Shakespeare's "Hamlet" on his three-hour cruise and Thurston Howell the Third had a record of "Carmen"
They put the two together in their play. I still can't separate the two in my head to this day. Whenever I hear the words "Neither a borrower nor a lender be..." I hear the tune "Votre Toast, je peux vous le rendre" from "Carmen". When I hear "Votre Toast, je peux vous le rendre" my brain overlays Shakespeare's line. There's more there, but this is what drifts to the forefront. I loved it when I heard it as a child. I bet I'm not the only one who had the same experience. Then there was "Madame Butterfly" with Shirley MacLaine in "My Geisha". I saw it on TV when I was in my very early teens. Shirley performed in "Madame Butterfly" as part of the plot. It captured me then. I can't hear Madame Butterfly without seeing Shirley's face crying and with her hand reaching out to her husband. I don't remember much about the movie, but I loved that opera from then on. And then, as an adult, I learned that many of the tunes accompanying my favorite cartoons were in fact, opera excerpts. I had no idea! Okay, so I know the subject of knitting may be boring to non-knitters. I'm sorry, I can't help it. It's a minor passion. Knitting fills some of my gaps. I like meticulous perfection. My home with two small children and two men is far from perfect, so little spots of perfection are so satisfying. I like art and need to indulge my creative impulses occasionally. The creation of yarn and the application of it in pattern and process works for me. There are so many areas and variables to tweak. Pattern. Yarn. Color. Fiber. Technique. Speaking of technique, I like working on technique. I enjoy finding a better way to do something. I like to streamline a process for efficiency and effect. I like wool. I like how it's efficient at keeping me warm by wicking and retaining heat so much better than manufactured fibers. I like that it comes from sweet sheep. I like how it feels and the great variety of textures there are. I like doing something useful that my mother, my grandmothers, and generations of ancesters have done. It connects me with them. 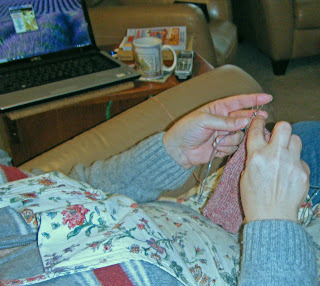 I like the community of modern knitters I see in blogs, on Ravelry, in gatherings of like-minded people. I like their knitting humor. This one's been around awhile, but I've been singing it around the house again lately. It's great. My family thinks I'm weird.